Youth anglers from around South Carolina will descend on the Midlands for the 2nd Annual S.C. Department of Natural Resources (DNR) Youth Bass Fishing Championship. The tournament will be held on Lake Murray March 29th with the weigh in at the Palmetto Sportsmen’s Classic at the SC State Fairgrounds in the Grand Stand for school affiliated bass fishing clubs. Student anglers in both middle and high school can send up to six anglers to fish in two man teams. Each two man team will share their boat with an adult volunteer. There will be a title for the winning middle school and high school; first, second and third places awarded to middle school and high school two man teams and to an individual in the middle and high school categories for the biggest fish. Trophies, medals, plaques and Abu Garcia and Berkley fishing gear will be awarded to the winners. 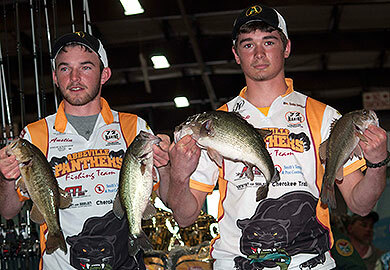 The top ranked high school two man team with the heaviest bag of fish for the tournament will receive scholarship funds. Each participant will receive a commemorative t-shirt sponsored by Lake Murray Country and the bragging rights of weighing in at the Palmetto Sportsmen’s Classic. Interested in forming a bass fishing club at your school? All you need to do is get a minimum of six students (within the 11-18 year old range) with dues paid and you can have a Youth Bass Fishing Club. You'll also need an adult at your school to help lead the club, provide advice and help arrange at least two club tournaments, fundraisers, speakers and other learning sessions pertaining to fishing for club meetings. The Youth Bass Fishing Clubs is a product of a partnership between the S.C. Department of Natural Resources, The Bass Federation of South Carolina and B.A.S.S with help and support from parents, teachers, school districts, local bait & tackle shops, community partners and Pure Fishing. Find out more by contacting DNR Aquatic Education Coordinator Lorianne Riggin at (803) 737-8483 or RigginL@dnr.sc.gov.